It was on this day in 1980 that Comedian Richard Pryor set himself on fire while freebasing cocaine. During the making of the film Bustin’ Loose, Pryor was enjoying a little cocaine and 151-proof rum when he went up in flames. He ran from his Northridge, CA home down Parthenia Street until subdued by two cops. Richard Pryor was taken to the hospital and treated for burns, which covered over 50% of his body. He spent six weeks recovering at the Grossman Burn Center at Sherman Oaks Hospital. Pryor’s eldest daughter Rain Pryor (who was on Head of the Class, by the by) has stated that her father poured the rum over his body and set him self on fire while in the throws of drug-induced psychosis. 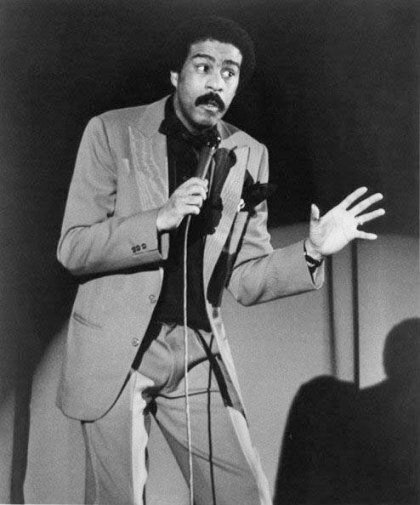 In 1982 Richard Pryor included a description of the freebasing indecent in his “final” comedy show Richard Pryor: Live on the Sunset Strip . I have no idea what or when this is from, but it’s friggin’ hilarious! previous post: Fashion Fights AIDS San Francisco – Because Enough Isn’t Being Done! next post: Shannon Price Wants All Of Gary Coleman’s Stuff.